Greeneview sophomore Cole Allen (33) led the Rams with 18 points scored in a 51-48 win Jan. 25 over South Charleston Southeastern, in Jamestown. Rams junior Gabe Caudill (25) launches a three-point try over Southeastern’s Tucker Eriksen, Jan. 25 at Greeneview High School. Greeneview’s Ian Tamplin (13) drives in for a score, during the first half of Friday night’s Ohio Heritage Conference boys high school basketball game in Jamestown. 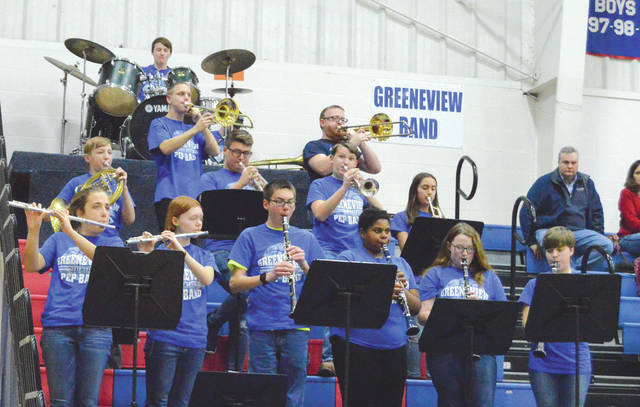 The Greeneview High School band entertained during timeouts, Jan. 24, at the Rams-Southeastern boys high school basketball game in Jamestown. 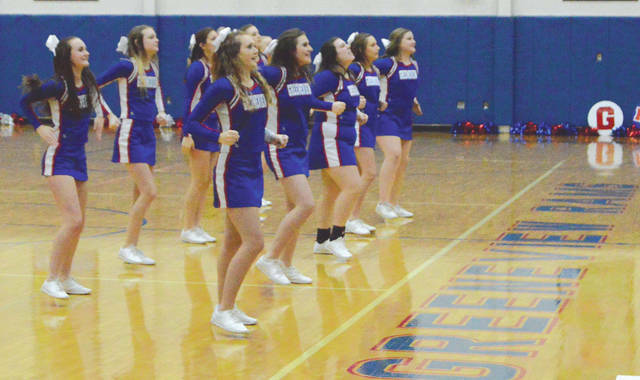 The Greeneview Rams cheerleaders fire up the crowd, during the first half of Friday’s boys high school basketball game in the Bradds Memorial Gymnasium in Jamestown. 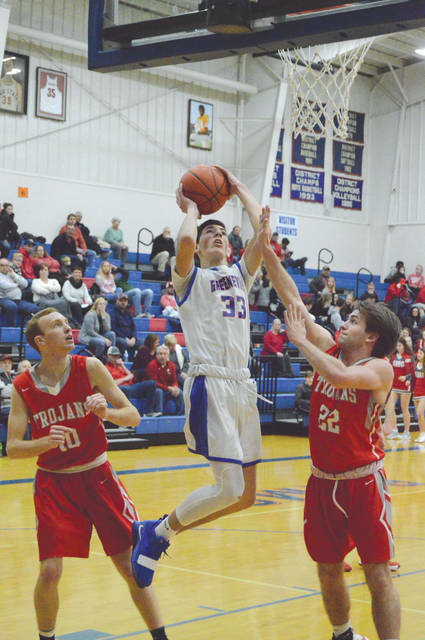 JAMESTOWN — The Greeneview Rams showed some tenacity, resilience and toughness that coach Kyle Fulk hasn’t always seen from his boys high school basketball team, in Friday’s battle with conference rival Southeastern. That fourth-quarter fight earned the Rams a 51-48 win over the visiting Trojans, Jan. 25 in the Gary Bradds Memorial Gymnasium. 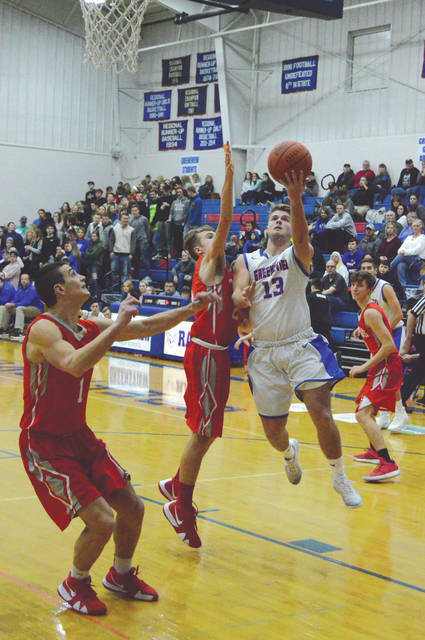 Greeneview could never quite muster more than a six-point lead through the first three quarters of play, and Southeastern was able to chip back to tie the game at 35 on a Charlie Bertemes steal just 25 seconds into the fourth quarter. Two Jacob Banion free throws gave the Trojans their first lead of the game with 6:51 left in the contest. The Rams went on a 5-0 mini run, to jump back in front 42-37, thanks to a pair of scores by Cole Allen, including an old-fashioned three, and two Nix free throws. But again Southeastern battled back, this time tying the contest at 44-all with 1:52 left to play. Nix wasn’t done scoring, though. The senior guard scored on an inside drive with 1:11 left to put the Rams up 46-44. After Southeastern converted one of two free throws to pull within a point, Nix was fouled to set up a double-bonus situation at the Rams free-throw line on Greeneview’s next possession downcourt. He hit one of two then, and hit his next four to give Greeneview the final 51-48 margin. Allen led the Rams with 18 points, Gabe Caudill finished with 10 points, and Nix went 6-for-6 from the line and hit that driving score — all in the fourth quarter — to finish with eight. With the win, Greeneview is now 6-10 overall, 4-8 in the Ohio Heritage Conference South. Trojan junior Bryce Grim led all scorers with 19 points, Bertemes finished in double figures as well with 16. Southeastern had a chance to at least tie the game late. Trojan coach John O’Laughlin called a timeout regardless of whether a Rams player made or missed his final free-throw try with 1.2 seconds left. The Rams player missed them both, but the head game official instructed the game clock operator to take 0.5 seconds off the clock to account for the time it took to snare the rebound. Greeneview’s Collin Wilson deflected the Southeastern inbounds pass and time then expired before the Trojans could get off a shot. The Southeastern loss knocks the Trojans out of a three-way tie for second in the OHC South with Greenon and Cedarville. Southeastern is now 7-8 overall, 6-6 in the division. 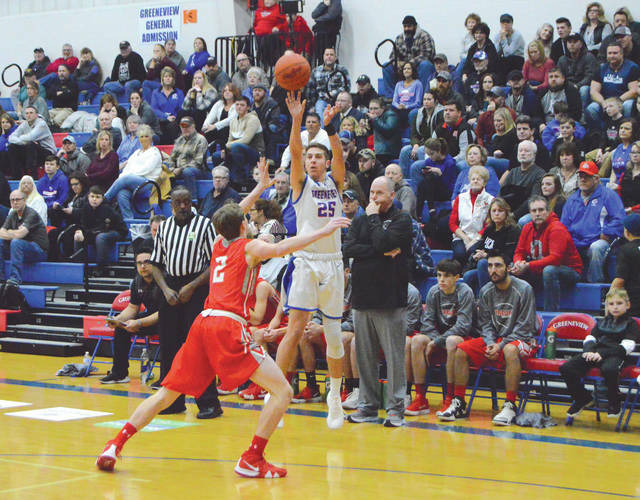 Greeneview has almost a week off before heading over to Springfield to take on Catholic Central for a 7:30 p.m. contest on Friday, Feb. 1 at CC’s Jason Collier Gymnasium. Southeastern also returns to OHC play on Ground Hogs Day. They’ll host Greenon that same night. Contact John Bombatch at 937-372-4444, Ext, 2123.